This book addresses many challenging topics related to the NoC research area. It starts by studying 3D NoC architectures and progresses to a discussion of NoC resource allocation, processor traffic modeling, and formal verification. NoC protocols are examined at different layers of abstraction. Also, several emerging research issues in NoC are highlighted in this book, such as NoC Quality of Service (QoS), testing and verification methodologies, NoC security requirements, and real-time monitoring. 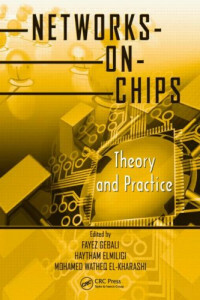 The book also tackles power and energy issues in NoC-based designs, as power constraints are currently considered among the bottlenecks that limit embedding more processing elements on a single chip. Fayez Gebali is a professor in the Department of Electrical and Computer Engineering, University of Victoria, British Columbia, Canada. He is a registered professional engineer and a senior member of the IEEE since 1983. Haytham Elmiligi is a Ph.D. candidate at the same school and was a publication chair for the 2007 IEEE Pacific Rim Conference on Communications, Computers and Signal Processing. M. Watheq El-Kharashi is currently an associate professor in the Department of Computer and Systems Engineering, Ain Shams University, Cairo, Egypt, and is also an adjunct assistant professor in the Department of Electrical and Computer Engineering, University of Victoria. Co-author of this book, and early member of the SilverStripe open source community. Internet Congestion Control provides a description of some of the most important topics in the area of congestion control in computer networks, with special emphasis on the analytical modeling of congestion control algorithms. This book constitutes the refereed proceedings of the 26th International Conference on Conceptual Modeling, ER 2007, held in Auckland, New Zealand, in November 2007.